REALLY GREAT CLASSIC PANTS. REALLY NICE PANTS! DON'T LET THESE GREAT PANTS GET BY YOU! These are our standard rates. Rates will be higher for large sizes or extra heavy jeans. U.S.A. CANADA OTHERS. OLD SCHOOL PANTS. REALLY NICE PANTS! 100% POLYESTER. DON'T LET THESE GREAT PANTS GET BY YOU! (21.6cm) Leg Opening. (31.8cm) Rise. These are our standard rates. Rates will be higher for large sizes or extra heavy jeans. POLY/COTTON BLEND THIN WALE CORDUROY. J.C. PENNEY - PLAIN POCKETS. These are our standard rates. Rates will be higher for large sizes or extra heavy jeans. U.S.A. CANADA OTHERS. A FEW LIGHT STAINS. 100% COTTON THIN WALE CORDUROY. OLD SCHOOL JEAN SHORTS. SOLID JEAN SHORTS. HAVE A FEW MINOR ISSUES, BUT STILL GREAT JEAN SHORTS! These are our standard rates. Rates will be higher for large sizes or extra heavy jeans. REALLY GREAT CLASSIC JEANS. NICE JEANS. DON'T LET THESE GREAT JEANS GET BY YOU! These are our standard rates. Rates will be higher for large sizes or extra heavy jeans. (25.4cm) Leg Opening. (35.6cm) Rise. The jeans pictured are the exact pair you will receive. Style: 501 Straight Leg / Button Fly. Perfectly worn in jeans are a staple of the Vagabonds Grunge Revival collection. Inside Leg: 31.5". Waist (doubled): 32". 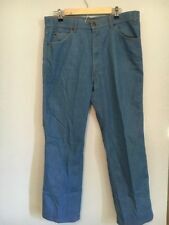 Vintage Levis 80s Mens High Waisted Baggy Dad Jeans Grade A 26 in. to 44 in. Style : Bell Bottom. Size : 34 X 34. Style : Bell Bottom. Size : 31 X 34. WHITE TAB ~ TALON ZIPPER #42. WAIST 16 1/4” RISE 11 1/2”. 100% COTTON ~ MADE IN USA. 80s era - perfect color! COLOR: TAN. LENGTH (INSEAM): 31. WIDTH(WAIST): 31. If you are very particular, then used clothing may not be for you. INTERNATIONALLY ASK FOR A QUOTE. Style : Bell Bottom. Size : 33 X 32. They are a light tan with an orange Levis tab. They have a zipper and button fly, classic 5 pocket design, and straight legs. Length-43". Inseam-32". ITEM #6781. 1980s-90s NOS Key Overalls. No flaws to note. ITEM #6782. 1980s-90s NOS Key Overalls. No flaws to note. Marked 36x30. REALLY GREAT CLASSIC PANTS! NICE PANTS! DON'T LET THESE GREAT PANTS GET BY YOU! (22.9cm) Leg Opening. (33.0cm) Rise. These are our standard rates. Rates will be higher for large sizes or extra heavy jeans.